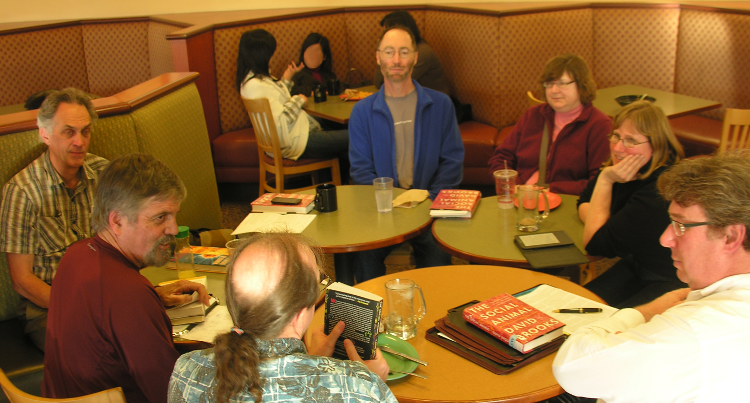 In early 2009, a Special Interest Group of San Francisco Regional Mensa began meeting as a reading group, with the theme of big ideas. We meet the second Saturday of the month at either of two standard meeting locations (exceptions noted). 3-5pm at Le Boulanger, 20488 Stevens Creek Blvd., Cupertino, CA 95014. Le Boulanger is at the southeast corner of De Anza and Stevens Creek in Cupertino, in front of the Cypress Hotel, with plenty of free garage parking. 4-6pm at Kepler's Books at 1010 El Camino Real, Menlo Park. Parking is available in their underground garage. All are welcome to attend. We have members from all over Silicon Valley and the San Francisco Bay Area. Each book is selected by the group at least a month in advance. Members are encouraged to read the book before the meeting. The format is open discussion, with just enough moderation to assure everyone gets a fair chance to share. We try to follow these guidelines. Our book list is below. We use this email list for announcements and some discussion. We often reconvene for dinner afterward, so see the restaurants link below. Contact . We welcome and encourage cross-participation with M-Readers, a Special Interest Group of American Mensa. We agreed to meet again in 100 years. I propose that we thank Aubrey de Gray, reread his book, and compare his expectations to what actually happened. 07-09-2011 Unbounding the Future: The Nanotechnology Revolution, by Drexler, Peterson, and Pegamit. 07-14-2012 Do Not Go Gentle, Book One, Discovery [book one of three], by Mark Millstorm (Muhlestein). Mark is a member of our group. This is his new book that has just came out on Kindle. You can download a free copy of Kindle and then download the book at $0.99. 11-10-2012 [4pm at Kepler's Books] The Evolution of Cooperation (Revised Edition), by Robert Axelrod with forward by Richard Dawkins. 12-08-2012 The Drunkard's Walk:How Randomness Rules Our Lives, by Leonard Mlodinow. 01-12-2013 [4pm at Kepler's Books] The Perfect Swarm: The Science of Complexity in Everyday Life, by Len Fisher. 02-09-2013 Paradox: The Nine Greatest Enigmas in Physics, by Jim Al-Halili. 03-09-2013 [4pm at Kepler's Books] Nine Algorithms That Changed the Future: The Ingenious Ideas That Drive Today's Computers, by John MacCormick. 05-11-2013 [4pm at Kepler's Books] Models. Behaving. Badly. : Why Confusing Illusion with Reality Can Lead to Disaster, on Wall Street and in Life. 06-08-2013 The Mind--Leading Scientists Explore the Brain, Memory, Personality, and Happiness. 01-11-2014 [4pm at Kepler's Books] Bad Science, by Ben Goldacre. We followed the discussion with a holiday celebration, a Chinese dinner. 02-08-2014 Why Nations Fail: The Origins of Power, Prosperity, and Poverty, by Daron Acemoglu and James Robinson. 05-10-2014 [4pm at Kepler's Books] Naked Statitistics: Stripping the Dread from the Data, by Charles Wheelan. 07-12-2014 [4pm at Kepler's Books] Probably Approximately Correct: Nature Algorithms for Learning and Prospering in a Complex World, by Leslie Valiant. 08-09-2014 Kinds of Minds:Toward An Understanding Of Consciousness, by Daniel C. Dennett. After the meeting, we met for dinner to celebrate 5 years of BIRG! 02-14-2015 Will You Be Alive 10 Years From Now? 07-11-2015 [3pm at Le Boulanger, followed by 6th anniversary dinner] Explaining the Computational Mind. 10-10-2015 [4pm at Kepler's books] The Island of Knowledge -- The Limits of Science and the Search for Meaning, by Marcelo Gleiser. 11-14-2015 [4pm at Kepler's books] Packing for Mars: The Curious Science of Life in the Void, by Mary Roach. 12-12-2015 Social: Why Our Brains are Wired to Connect, by Matthew D. Leiberman, Ph.D..
01-09-2016 [3pm at Le Boulanger] Nothing: Surprising Insights Everywhere from Zero to Oblivion, by Jeremy Webb. 02-13-2016 [4pm at Kepler's Books] How-Nature-Works-Self-Organized Criticality, by Per Bak. 03-12-2016 [4pm at Kepler's Books] The Perfect Theory: A Century of Geniuses and the Battle Over General Relativity, by Prof. Pedro Ferreira. 04-09-2016 The Science of Interstellar, by Kip Thorne. 05-15-2016 The Quark and the Jaguar: Adventures in the Simple and the Complex, by Murray Gell-Mann. 06-11-2016 Second Machine Age: Work, Progress, and Prosperity in a Time of Brilliant Technologies, by Erik Brynjolfsson, and Andrew McAfee. 07-09-2016 [4pm at Kepler's Books] What Philosophy Can Do, by Gary Gutting. 08-13-2016 [4pm at Kepler's Books] Climbing Mount Improbable, by Richard Dawkins. 09-10-2016 [4pm at Kepler's Books] Spooky Action at a Distance, by George Musser. 10-08-2016 [4pm at Kepler's Books] Symmetry: A Journey into the Patterns of Nature, by Marcus du Sautoy. 11-12-2016 [4pm at Kepler's Books] Big Data: A Revolution That Will Transform How We Live, Work, and Think, by Viktor Mayer-Schönberger and Kenneth Cukier. 12-10-2016 Predictive Analytics: The Power to Predict Who Will Click, Buy, Lie or Die, by Eric Siegel. 01-14-2017 Being Mortal: Medicine and What Matters in the End, by Atul Gwande. 02-11-2017 [4pm at Kepler's Books] Evolution of the Social Contract, by Brian Skyrms. 03-11-2017 [4pm at Kepler's Books] Misbehaving: The Making of Behavioral Economics, by Richard H. Thaler. 04-08-2017 [4pm at Kepler's Books] A Different Universe: Reinventing Physics from the Bottom Down, by Robert Laughlin. 05-13-2017 Dinner on the Deck Now: The Physics of Time, by Richard A. Muller, author of Physics for Future Presidents. 06-10-2017 [4pm at Kepler's Books] Void: The Strange Physics of Nothing (Foundational Questions in Science), by James Owen. 07-15-2017 DATE CHANGE! and [4pm at Kepler's Books] The Big Picture: on the Origins of Life, Meaning and the Universe Itself, by Sean Carroll. 08-12-2017 Fashion, Faith, and Fantasy in the New Physics of the Universe, by Roger Penrose. 09-09-2017 [4pm at Kepler's Books with celebratory dinner] How Not to be Wrong The Power of Mathematical Thinking, by Jordan Ellenberg. 10-14-2017 [4pm at Kepler's Books] How the Mind Works, by Steve Pinker. 11-11-2017 [4pm at Kepler's Books] The Knowledge Illusion: Why We Never Think Alone, by Steven Sloman and Philip Fernbach. 12-09-2017 [3pm at Le Boulanger] Brainwashed: the Seductive Appeal of Mindless Neuroscience, by Sally Satel, Scott O. Lilienfeld. 01-13-2018 [3pm at Le Boulanger with Dinner on the Deck] Capital in the Twenty-First Century, by Thomas Pikkety. 02-10-2018 [4pm at Kepler's Books] Cyberspies: The Secret History of Surveillance, Hacking, and Digital Espionage, by Gordon Corera. 03-10-2018 [4pm at Kepler's Books] Language: The Cultural Tool, by Daniel L. Everett. 04-14-2018 [4pm at Kepler's Books] The Gene: An Intimate History, by Siddhartha Mukherjee. 05-12-2018 [4pm at Kepler's Books] I Contain Multitudes: The Microbes Within Us and Grander View of Life, by Ed Yong. 06-09-2018 [3pm at Le Boulanger] Artificial Intelligence: What Everyone Needs to Know, by Jerry Kaplan. 07-14-2018 [3pm at Le Boulanger with Dinner on the Deck] Progress: Ten Reasons to Look Forward to the Future, by Johan Norberg. 08-11-2018 [4pm at Kepler's Books] The Retreat of Western Liberalism, by Edward Luce. 09-15-2018 change and [4pm 4pm at Kepler's Books] Life Unfolding: How the Human Body Creates Itself, by Jamie A. Davies. 10-13-2018 [4pm at Kepler's Books] Superintelligence, by Nick Bostrom. 11-10-2018 [4pm at Kepler's Books] A Crack in Creation, by Jennifer Doudna and Samuel Sternberg. 12-08-2018 [3pm at Le Boulanger with Dinner on the Deck] Life 3.0: Being Human in the Age of Artificial Intelligence, by Max Tegmark. 01-12-2019 [3pm at Le Boulanger with Dinner on the Deck] The Great Unknown: Seven Journeys to the Frontiers of Science, by Marcus Du Sautoy. 02-09-2019 NOTE: [4pm at Kepler's Books] Rise of the Robots: Technology and the Threat of a Jobless Future, by Martin Ford. 03-09-2019 NOTE: [4pm at Kepler's Books] Astrophysics for People in a Hurry, by Neil deGrasse Tyson. 04-13-2019 NOTE: [4pm at Kepler's Books] The Order of Time, by Carlo Rovelli. An expanded book list has a brief description of some of the books. This bookshelf has the candidates for our next round of reading.